Editor’s Morning Note: We spend too much time together complaining that unicorns and other startups are shiftless ninnies when it comes to real financial maturity and going public. Here’s a piece of the counterargument. Earnings Season: It is a tale / Told by an idiot, full of sound and fury / Signifying nothing. Being a public company is hard. The reasons are myriad. Missing a quarter’s expectations can collapse a firm’s value, profitable businesses can explain too much about where they generate margin, and even healthy firms can fall prey to overenthusiastic analysts and journalists who expect the moon, but only model for a GPS satellite. Workday, a public SaaS shop, recently endured a steep decline in its valuation following a quarter that didn’t excite investors. Let’s learn from it. Let’s see what Workday built. FQ3’17 revenue result: $409.6 million. FQ3 revenue analyst expectation: $400 million. FQ3 GAAP EPS analyst expectation: Unclear, oddly. FQ3 magic EPS analyst expectation: ($0.04). The company’s revenue grew from $305.3 million in the year-ago quarter to $409.6 million in its most recent. That’s just over $100 million in new top line. And keep in mind that the vast majority of Workday revenue is recurring. So it could be valued just a smidge more than other incomes. 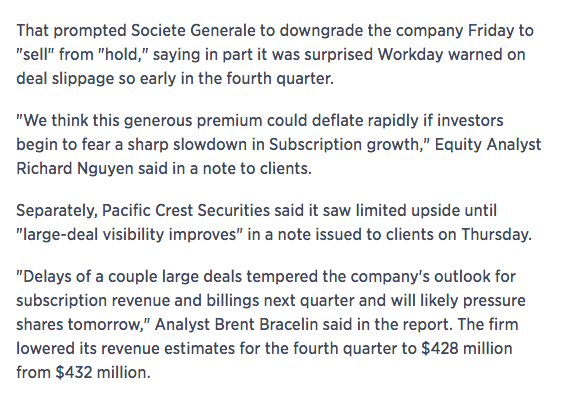 Workday did see its net loss expand from $77.8 million to $114.1 million. That’s not good, but the firm’s cash hoard remains near the $2 billion mark. For a company worth under $13 billion today, that’s a lot of ammo. Unlike Twitter, Workday isn’t discussed much. So let’s play a game: Do you know the first name of Twitter’s CEO, and do you know Workday’s industry aside from SaaS? More than half of you only got the first half of the question correctly. That’s ok. However, despite the lack of coverage and discussion concerning Workday, investors pay attention. After all, the damn thing is worth eleven digits. It only takes some worry, a slightly lacking quarter, and no positive delta from expectations to shed a unicorn in value. All this is to translate again from the public markets to the private, and from the private markets to the public, showing how companies that are even meeting investor expectations after IPO can have a rough go of it. Perhaps there is a reason why we are seeing so much unicorn caution. To honor the lesser gods of disclosure, I like Jason and have consumed beverages with him on several occasions.